Description: Simply breathtaking! 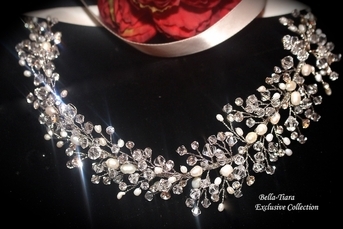 This gorgeous bridal hair vine is decorated with sparkling rhinestones, Swarovski crystals and luxurious freshwater pearl in a rhodium setting. A single hoop is stationed at the end of this piece to secure the hair vine in place with bobby pins. 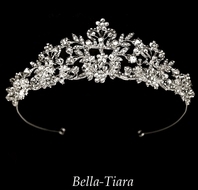 This accessory is both flawless and stunning, appropriate for weddings, proms, homecomings, or any elegant affairs. Measures: 12 1/2" x 3/4"
Sposa - Elegant Swarovski crystal and pearl wedding hair barrette - SALE!! !